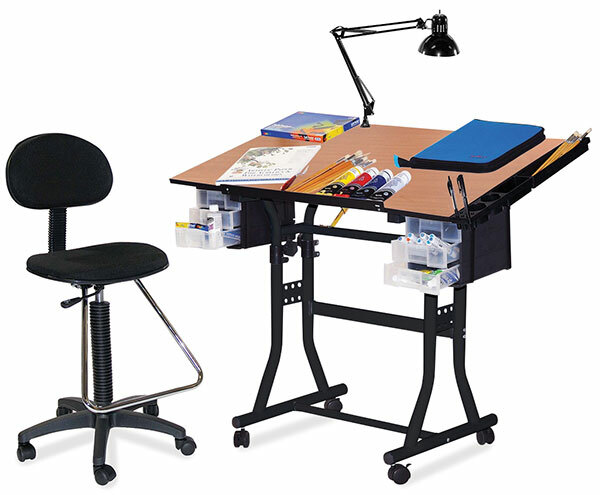 The Creation Station Studio Set combines a great utility table with a drafting-height chair, lamp, and storage galore for the crafter, hobbyist, architect, or artist — all at an affordable price! The 24" × 40" (61 cm × 102 cm) tabletop features square corners and a one-hand tilt mechanism that adjusts the angle from 0° to 45°. The table height adjusts from 31" to 34" (79 cm to 86 cm) in the horizontal position (desk height to drafting height). The frame features sturdy 1½" (4 cm) diameter tubular steel construction with a powder-coated finish.